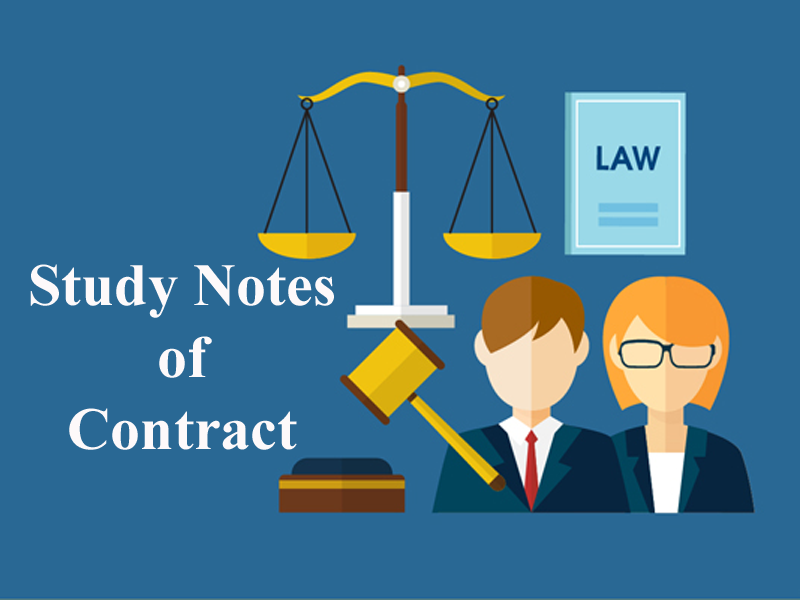 Here we are providing you updated and most relevant Study notes on Contract of Offer and Acceptance for Law Entrance Exam. These study notes are highly recommendable for all those who aspire to crack CLAT, DULLB, AILET and other Law Entrance Exam. c) It must be made with a view to obtain the consent of the other person to the proposed act or abstinence. There is no requirement under the Indian Contract Act that the offer and acceptance must be made with an intention of entering into a legal relationship. However, it is a principle under the English Law that “to create a contract there must be a common intention of the parties to enter into legal obligation”. A husband agrees to send his wife 30 ponds every month, while he was away. After a year he failed to pay the amount, his wife brought an action against him for not keeping his promise. It was a question before the court to decide whether the agreement was social agreement or agreement under the contract law. The court verdict in favour of Mr Balfour and held that he is not liable for the promise he made as it is not a contract. There was no intention of creating a legal obligation. Rule 2: A statement of intention is not an offer. At times, it has been seen that many people give statements, to do something in the future, on happening of an event. Such statements are merely an intention, which should not be mistaken for an offer. Example: An in the course of his conversation with B, says that he is planning to give Rs.1 crore to the groom marrying his daughter with his consent. The statement given by A is an intention, not an offer. Rule 3: A mere exchange of information is not an offer. Counter offers and Invitation to offer is not an offer. An invitation to an offer is different form offer as in offer if it is accepted by the other party it gives rise to legal consequence but invitation to offer is a situation where offer is invited from the other party and it is on the party inviting offers either to accept the offer made by opposite party or not to accept it. Example: Catalogue of books, goods disclosed in the showcase, auction sale, quotation, tenders etc. are the example of the invitation to offer. X sent a telegram to Y asking, “Will you sell Bumper Hall Pen? Quote the lowest price”. Y replied through a telegram “Lowest price for Bumper Hall Pen is 900 pounds”. X replied stating “I agree to buy Bumper Hall Pen for 900 pounds”. In a suit brought by X against Y, the Court held that quoting of price by Y is a merely a supply of information and not an offer. Note: Bumper hall pen is a triangular shape plot (piece of land). A counter offer is where the original offer is rejected by the creation of a new offer. For Example, if A offers to sell a land for 5 Lakh Rupees and B negotiates to 3 Lakh Rupees then B’s negotiation will be considered as a counteroffer. The counteroffer nullifies the original offer made by A. Is there is any difference between General offer and specific offer? Yes, a general offer is an offer to the world at large whereas a specific offer is an offer to a specific person. Carbolic smoke Ball company, a pharmaceutical company, was interested in testing a new drug in the market. They advertised in the paper promising a reward of 100 pounds to anyone, who used the drug and contracted the disorder called influenza. One, Mrs Carlill bought it and used it as per the instructions printed on the label. Upon contracting influenza, she contacted the company to claim the reward. The company refused to pay her the promised sum. The Court held that the company was liable to pay Mrs Carlill, as there arose a contract between the lady and the company, as soon as she fulfilled the condition. An offer must be communicated, if not communicated then the question of acceptance does not arise. The best example is of Lalman Shukla V. Gauri Dutt in which a servant founds the lost boy of his master but the servant was not awarded. A master sent his servant in search of his missing nephew. In the meantime, the master advertised in the newspaper, promising a reward of Rs. 500 to anyone who traces the boy. The servant brought back the boy. After a couple of days, the servant came to know about the reward and claimed it. Held: The servant was not entitled to the reward, for doing something but in ignorance of an offer cannot be construed as acceptance. Rule: 6 Terms of the offer must be certain. Uncertainty in terms of offer makes it vague and ambiguous. It will not give rise to any legal consequence, as uncertain, vague, indefinite and ambiguous offers are not valid offers. Example (1): X offers to sell some wheat to B for some price. X did not specify the quantity, quality or money for the wheat, hence it is not a valid offer. Contracts through post differ from contracts made in person. When parties sit across a table and enter into a contract, the offer and acceptance are almost instantaneous. So, the question of revocation of offer and acceptance does not arise. But, in contracts made through the post, the offeror and acceptor may revoke their offer and acceptance, respectively. This topic is explained by a simple illustration with the reasoning. Situation No: 1: A posts a letter of offer to B. B can accept the offer when the letter of offer reaches him. The offer should be communicated to the offeree. Situation No: 2: B posts the letter of acceptance. Now, B has done whatever is necessary and within his power to conclude the contract. The letter is now out of the reach of B. So, a contract has come into existence of which B ALONE can enforce against A. Situation No: 3: The letter of acceptance reaches A. Acceptance having been communicated A can NOW enforce the contract against B. Note: Even if the letter of acceptance does not reach A, B can enforce the contract against A. Case Law: House Hold Fire and Carriage Accident Insurance Company Ltd. v. Grant. The defendant applied for allotment of shares in a company. This was the offer. The Company allotted shares to the defendant and the letter of allotment (i.e. acceptance of the offer) was posted. The letter did not reach the defendant. Later on, the defendant was called upon to pay for the shares. It was held that the defendant had to pay for the shares through the letter of allotment of shares had not reached him. Situation No: 4: Revocation of Offer: If A wants to revoke the offer, he should do so before B can enforce the contract against A. B gets a right under the contract the moment B posts the letter of acceptance. Hence, for the revocation of the offer to be effective, the letter of revocation of offer should reach B before B posts the letter of acceptance. Situation No: 5: Revocation of Acceptance: If B wants to revoke the acceptance; he should do so before A can enforce the contract against B. A gets the right under the contract when the letter of acceptance reaches A. Hence, for the revocation of acceptance, the letter conveying the same should reach A, earlier than the letter of acceptance itself. In other words, the letter of revocation of acceptance should overtake the letter of acceptance. In order to be legally effective, it must be an absolute and unqualified acceptance of all the terms of the offer. Even the slightest deviation from the terms of the offer makes the acceptance invalid. Rule 2: Acceptance must be given only by the person to whom the offer is made. A sold his business to his manager B without disclosing the fact to his customers. C, a customer, who had a running account with A, sent an order for the supply of goods to A by name. B received the order and executed the same. C refused to pay the price. It was held that there was no contract between B and C because C never made any offer to B and as such C was not liable to pay the price to B. Mental acceptance or quiet assent not evidenced by words or conduct does not amount to a valid acceptance, and this is so even where the offeror has said that such a mode of acceptance will suffice. Acceptance must be communicated to the offeror, otherwise, it has no effect. There are a few exceptions to this rule. However, it must be kept in mind that whether silence amounts to the agreement is still an issue that the law will be determined based on the given facts of the case. F offered by a letter to buy his nephew’s horse for $30 stating “If I hear no more from you, I shall consider the horse mine.” The nephew sent no reply as suggested by F, but told B his auctioneer, not to sell that particular horse, as he intended to sell that horse to F. B sold the horse by mistake. It was held, F could not succeed because his nephew had not communicated his acceptance to him. Rule 4: Acceptance must be given within a reasonable time and before the offer lapses. To be legally effective acceptance must be given within the specified time limit if any, and if no time is stipulated, acceptance must be given within a reasonable time. Note: What is a reasonable time depends on the facts and circumstance of the case. 1. Sec 2(a) of The Indian Contract Act,1872 deals with? D. person to whom the proposal is made. 12. ‘A’ offers to sell his house to ‘B’ for some price. Is this a valid offer? 15. ________ nullifies the original offer and creates a new offer. A makes an offer to B and posts the letter at 2:30 PM on 21st Feb 2015 and B receives the letter at 11:30AM on 24th Feb 2015. B posts his letter of acceptance at 4:30PM on 24th Feb 2015. A receives it at 10:30AM on 26th Feb.
22. When is the offer complete against A? 23. When is the offer complete as against B? 24. When is the acceptance complete as against A? 25. When is the acceptance complete as against B? 27. Which Sec. of The Indian Contract Act deals with acceptance being absolute? 29. A offers to sell his house to B for 5 Lakh Rupees. B agrees to buy the house for 3 Lakh Rupees. What B made is? 30. X offers to buy Y’s horse for 50 thousand Rupees. Y thinks of selling his horse to X but doesn’t mention it to him. Does this amount to acceptance? Get the updated and most relevant study notes on Contract of Offer and Acceptance for upcoming CLAT and other Law Entrance Examination.